Signed and dated lower right: J Severn/Rome 1821. Charles Brown's drawing of the room and its furniture seems to have been accurate enough though the mezzotint hanging on the wall does not correspond exactly to any authentic portrait of Shakespeare. It is probably Brown's free interpretation of an 18th century mezzotint by John Simon of the so-called 'Soest Portrait' (John Chaloner Smith, British Mezzotint Portraits, 133). In spite of Severn's statement to Scharf that the picture was painted in the autumn of 1821, and the date 1821 on the canvas, there is evidence to show that it was not finished to Severn's satisfaction until 1822 or even 1823. It was begun in May 1821: 'I have begun a small whole length of him - from last seeing him at Hampstead' (letter to Taylor 16 May 1821, Keats Circle, I, p 249), and was still under way in January 1822: 'The picture is not completed - I cannot finish it to please me - without the mask [probably the life-mask] I have seen at your House …' (ibid., p 128). Severn wrote to both his father and Brown in December saying he hoped to have it ready for exhibition in London the next summer so it was probably finished then, though there is no record of its being exhibited. The picture was exhibited several times by Severn, with the eyes looking upwards as mentioned in his letter to Scharf. These were followed by a trio of romantic evocations, 'Keats listening to the Nightingale' now in Keats House, 'Shelley in the Baths of Caracalla' in Keats-Shelley Memorial House, Rome (with a copy in Lord Abinger's collection), and 'Byron reciting Childe Harold in the Forum', destroyed in about 1950. 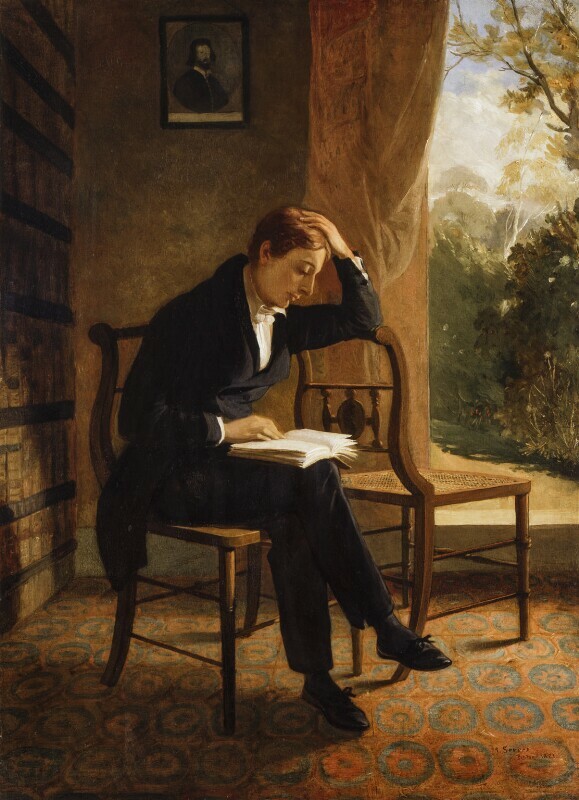 Copies: A copy is in a private collection London; a copy by Linnell, painted in 1834 for William Empson, was in Miss Watt Chesterfield's collection in 1917, showing Keats with eyes open looking upwards; a watercolour replica of this in the Vaughan Library, Harrow School, is known as the Houghton-Crewe version and was used by Buxton Forman for the frontispiece to his 1906 edition of Keats's Works; a copy by Dyer in Keats House is inscribed: Edmund Dyer/after/Joseph Severn/in/NPG and given by the Vahil family of Bombay in memory of Behram A. Vahil in 1933. Other copies exist. Whole-length seated in his room in Wentworth Place, right hand on a book, left to his head; black suit, white shirt and bow-tie, light brown hair, pale complexion; cane-seated chairs, bookcase to left, mezzotint portrait of Shakespeare on wall behind, trees through french window right, red and blue patterned carpet. The artist and sold by him to S. Smith Travers who gave it to the NPG in 1859 (letter of 15 December 1868 in NPG archive). 'La peinture romantique anglaise', Paris, 1972 (249).